Lots of people think that making their own pastry from scratch is too difficult, but it needn’t be. Pastry is incredibly cheap to make and is useful for a wide range of both sweet and savoury dishes. Sift the flour into a bowl. Add the cubed fat to the sifted flour and pinch of salt. 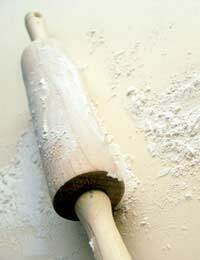 Use a knife to ‘cut’ the fat into the flour. Now, it’s time to get your (clean!) hands messy. Rub the fat into the flour with your fingers. Rub until the mixture is crumbly. Now it’s time to add the water. The water should be as cold as possible. You will probably need about two tablespoons - depending on your mixture. Add the water and bring the mixture together into a dough. Make sure there are no floury deposits left. Just keep adding water very gradually as you need to until you have a dough ball. Place your shortcrust pastry dough ball into a plastic bag (sandwich bags or freezer bags are fine), and leave it in the fridge for at least half an hour. The dough will keep like this for a couple of days though if necessary. You can also freeze it if you want to use it at a later date. This ‘resting’ phase of pastry-making should not be skipped or your pastry is likely to crack and crumble. You can now roll your pastry to make dishes such as pies, flans and quiches. Flaky pastry is ideal for dishes such as pasties, vol au vents and sausage rolls. It’s also known as quick puff pastry or ‘rough puff’ and it’s much easier to make. Place the butter in clingfilm and put it in the freezer for about half an hour. It needs to be firm enough so that you can grate it. Sift the flour and salt into a bowl and then grate the butter in. Use a knife, not your hands – they’re too warm – to again ‘cut’ the fat into the flour. Add a sprinkle of cold water to make a dough. You can now use your hands. Once you have all the mixture in a dough, wrap it in clingfilm again and rest for 30 minutes in the fridge. This pastry can be frozen as well. I thought this was very useful it helped me (ALOT) but next time you might want to add things that you coud do with the pastry oh and tell us what the difference beween pastry and flakey pastry is.